Cancer of the salivary gland is a malignant tumor of the tissues that produces saliva. Saliva is the fluid that is released into the mouth to keep it moist and contains enzymes that begin breaking down food. Saliva also helps prevent infections of the mouth and throat. There are clusters of salivary glands below the tongue, on the sides of the face (in the cheek area) just in front of the ears, in the area of the upper jaw along the inside of the teeth and the soft palate, as well as under the jawbone. Smaller clusters of salivary glands are present in parts of the upper digestive tract mucosa (tissue lining) and the windpipe. Cancer begins when cells in the body become abnormal and multiply without control or order. These cells form a growth of tissue, called a tumor. A tumor can be benign or malignant. A benign tumor is not cancerous and usually can be removed without growing back. A malignant tumor is cancerous and can invade and damage the body's healthy tissue and organs. Most cancerous tumors begin in the largest of the salivary glands, the parotid gland, found on either side of the face in front of the ears; and the submandibular glands, found under the jawbone. Salivary gland cancer can also begin in the sublingual glands or the minor salivary glands. 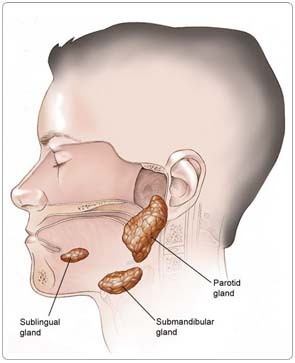 Most tumors (80%) in the parotid gland and about half of the tumors in the submandibular gland are benign (noncancerous). Sublingual gland tumors are almost always malignant (cancerous). A risk factor is anything that increases a person's chance of developing a disease, including cancer. There are risk factors that can be controlled, such as smoking, and risk factors that cannot be controlled, such as age and family history. Although risk factors can influence disease, for many risk factors it is not known whether they actually cause the disease directly. Some people with several risk factors never develop the disease, while others with no known risk factors do. However, knowing your risk factors and communicating them to your doctor may help you make more informed lifestyle and health-care choices. Radiation exposure. Radiation to the head/neck for other medical reasons may increase the risk of salivary gland cancer. Radioactive substance exposure. In some reports, exposure to certain radioactive substances may increase the risk of salivary gland cancer; in other reports, there is insufficient evidence to support this. Consult your doctor for more information. Environmental exposure. Exposure to sawdust and chemicals used in the leather industry, pesticides, and industrial solvents may increase the risk of a type of salivary gland cancer that occurs in the nose and sinuses. Other possible risk factors that doctors are investigating include occupational exposure to certain metals (nickel alloy dust) or minerals (silica dust), a diet low in vegetables and high in animal fats, and exposure to hair dye or hairspray (this association has not yet been proven). There is no known way to prevent salivary gland cancer. People with salivary gland cancer may experience the following symptoms. Sometimes, people with salivary gland cancer do not show any of these symptoms. Or, these symptoms may be caused by a medical condition that is not cancer. If you are concerned about a symptom on this list, please talk with your doctor. People who notice any of these warning signs should consult a doctor and/or dentist right away. When detected early, cancers of the head and neck have a much better chance of cure. Because many of these symptoms can be caused by other, noncancerous health conditions as well, it is always important to receive regular health and dental screenings; this is particularly important for those people who routinely drink alcohol or currently use tobacco products or have used them in the past. In fact, people who use alcohol and tobacco should receive a general screening examination at least once a year. This is a simple, quick procedure in which the doctor looks in the nose, mouth, and throat for abnormalities and feels for lumps in the neck. If anything unusual is found, the doctor will recommend a more extensive examination using one or more of the diagnostic procedures mentioned under Diagnosis. A medical history and physical examination have to be done carefully, identifying potential risk factors. If a facial nerve paralysis is present, specific function tests will be required, and an inspection of the oral cavity, hypopharynx, and larynx will also be done. There are no specific blood or urine tests that can detect a salivary gland tumor, and there are no tumor markers (substances found in higher than normal amounts in the blood, urine, or body tissues of people with certain kinds of cancer) for salivary gland cancer known at this time. Fine needle aspiration. Cells are withdrawn using a thin needle inserted directly into the tumor. The cells are examined under a microscope for signs of cancer, and should be examined by a cytologist with expertise in salivary gland cancer. Endoscopy. A thin, flexible tube with an attached light and view lens is inserted through the mouth or nose to examine the head and neck areas. The examination has different names depending on the area of the body that is examined, such as laryngoscopy (larynx), pharyngoscopy (pharynx), or a nasopharyngoscopy (nasopharynx). It is performed using an anesthetic spray or general anesthesia to make the person more comfortable. Computed tomography (CT or CAT) scan. A CT scan creates a three-dimensional picture of the inside of the body with an x-ray machine. A computer then combines these images into a detailed, cross-sectional view that shows any abnormalities or tumors. Magnetic resonance imaging (MRI). An MRI uses magnetic fields, not x-rays, to produce detailed images of the body, especially images of soft tissue, such as the tonsils and base of the tongue. Ultrasound. In this test, a video image of the inside of the body is produced using sound waves. Ultrasound is used to check lymph nodes in the neck and to assist in fine needle aspiration biopsy. Positron emission tomography (PET) scan. In a PET scan, radioactive sugar molecules are injected into the body. Cancer cells absorb sugar more quickly than normal cells, so they light up on the PET scan. PET scans are often used to complement information gathered from CT scan, MRI, and physical examination. PET scanning is especially useful to detect possible cancer in other organs (metastasis, or spreading) or hidden primary tumors. Additionally, a dentist, in his or her evaluation of the person with salivary gland cancer, may order specific imaging studies for the teeth, including a panorex (a rotating, or panoramic, x-ray) of the mandible (jawbones). The treatment of salivary gland cancer depends on the size and location of the tumor, whether the cancer has spread, and the person's overall health. In many cases, a team of doctors will work with the patient to determine the best treatment plan. Cancer of the salivary gland can be cured, especially if found early. Although curing the cancer is the primary goal of treatment, preserving the function of the nearby nerves, organs, and tissues is also very important. When doctors plan treatment, they consider how treatment might affect a person's quality of life, how a person feels, looks, talks, eats, and breathes. Head and neck cancer specialists often form a multidisciplinary team to care for each person, and an evaluation should be done before any treatment begins. The team may include medical and radiation oncologists; surgeons; otolaryngologists (ear, nose, and throat doctors); maxillofacial prosthodontists; dentists; physical therapists; speech pathologists; psychiatrists; nurses; dietitians; and social workers. During surgery, doctors perform an operation to remove the cancerous tumor and some of the healthy tissue around it (called a margin). The goal of surgery is to remove as much of the tumor as possible and leave negative margins (no trace of cancer in the healthy tissue). Surgery is performed in nearly all cases of salivary gland cancer. Depending on the location, stage, and the subtype of the cancer, some people may need more than one operation to remove the cancer and to help restore the appearance and function of the tissues affected. Reconstructive and plastic surgery may be used to replace normal tissues and nerves that have to be removed to eliminate the cancer. Sometimes, surgery is followed by radiation treatment. Sometimes, it is not possible to completely remove the cancer during surgery. Surgery is often risky because the cancer may be close to the eyes, mouth, brain, and important nerves and blood vessels in the area. The type of surgery depends on the extent of the tumor. Parotidectomy. The removal of the parotid gland is called a parotidectomy. This surgery is done with dissection of the facial nerve. If cancer has spread to the facial nerve, frequently a nerve graft is necessary for the rehabilitation of the facial muscles. Facial disfigurement that may have been present prior to surgery may need to be addressed using reconstructive plastic surgery. Any tissue that is removed can often be restored by microvascular surgery and free tissue transplantation. Endoscopic surgery. Occasionally, it is possible to remove the tumor by endoscopic surgery, which is less destructive to normal tissues than conventional surgery. This is used particularly when a salivary gland tumor begins in the paranasal area or in the larynx. For cancer itself, endoscopic surgery is rarely used, and may only be recommended for some people. More often, this procedure may find cancer during a seemingly routine endoscopic surgery for what is believed to be chronic sinusitis. Surgery often causes swelling of the face, mouth, and throat making it difficult to breathe and swallow. Frequently, a person may receive a temporary tracheostomy (hole in the windpipe) to make breathing easier. Facial nerves may also be affected, either temporarily or permanently. Facial disfigurement may need to be addressed using reconstructive plastic surgery. If the maxilla (upper jaw) is removed, prosthodontists play a large role in the rehabilitation process. A neck dissection (lymph nodes in the neck are removed) may be performed if the doctor suspects that the cancer has spread. A neck dissection may cause numbness of the ear, weakness when raising the arm above the head, and weakness of the lower lip. The side effects are caused by injury to nerves in the area. Depending on the type of neck dissection, weakness of the lower lip and arm may go away in a few months. Weakness will be permanent if a nerve is removed as part of a dissection. A new method of external radiation therapy, known as intensity modulated radiation therapy (IMRT), allows for more effective doses of radiation therapy to be delivered while reducing the damage to healthy cells and causing fewer side effects. Internal radiation therapy, also called interstitial radiation or brachytherapy, involves tiny pellets or rods containing radioactive materials that are surgically implanted in or near the cancer site. The implant is left in place for several days while the person stays in the hospital. Radiation treatment can be the main treatment for certain tumors or if a person cannot have surgery or decides not to have surgery. It is most often used in combination with surgery, given either before or after the operation. It may also be given along with chemotherapy. Before beginning radiation treatment for salivary gland cancer, a person should receive a thorough examination from an oncologic dentist (a dentist with experience in treating people with head and neck cancer). Since radiation therapy can cause tooth decay, damaged teeth may need to be removed. Often, tooth decay can be prevented with proper treatment from a dentist before beginning treatment. Radiation therapy may also cause a condition called hypothyroidism, in which the thyroid gland (located in the neck) slows down and causes the person to feel tired and sluggish. People who receive radiation therapy to the neck area should have their thyroid checked regularly. Chemotherapy is the use of drugs to kill cancer cells, and is seldom used in the initial treatment of salivary gland cancer. Combined treatments of chemotherapy with radiation therapy are used as part of clinical trials because they remain under investigation. Chemotherapy may be used in the case of cancer spread to other organs. Chemotherapy is most often used in advanced cancer or to treat symptoms. Some chemotherapy drugs are available in clinical trials that may treat cancer at an earlier stage, or hope to cure the cancer. Cancer and cancer treatment can cause a variety of side effects; some are easily controlled and others require specialized care. Below are some of the side effects that are more common to salivary gland cancer and its treatments. Difficulty swallowing (dysphagia). Dysphagia occurs when a patient has trouble getting food or liquid to pass down the throat. Some patients may gag, cough, or choke when trying to swallow, while others experience pain or feel like food is stuck in the throat. Difficulty swallowing is a relatively common side effect of some cancer treatments. Potential side effects of cancer treatment that can cause swallowing difficulties include soreness, pain, or inflammation in the throat, esophagus, or mouth (mucositis); dry mouth from radiation treatment or chemotherapy; infections of the mouth or esophagus from radiation treatment or chemotherapy; swelling or constriction of the throat or esophagus from radiation treatment or surgery; and physical changes to the mouth, jaw, throat, or esophagus as a result of surgery. Nervous system disturbances. Nervous system disturbances can be caused by many different factors, including cancer, cancer treatments, medications, or other disorders. Symptoms that result from a disruption or damage to the nerves caused by cancer treatment (such as surgery, radiation treatment, or chemotherapy) can appear soon after treatment or many years later. After treatment for salivary cancer ends, people should receive regular follow-up medical and dental examinations to check for signs of recurring cancer (cancer that comes back), a secondary cancer (a different type of cancer), and to manage any late or long-term side effects from cancer treatment. Most recurrences happen in the first two or three years after diagnosis, so follow-up visits will be more frequent in the first two years. Diagnostic examinations may be repeated to detect recurrences or document the progress of current treatment. If cancer recurs, testing and treatment must begin again. Rehabilitation of lost functions in the head and neck is often necessary following treatment. Special care of the eye is necessary in the case of 7th (facial) nerve function loss. Rehabilitation of swallowing is often needed, and special procedures (moving a paralyzed vocal cord to improve voice, for example) may be necessary after removal of a large skull base tumor. Exposure to direct sunlight is to be avoided if radiation therapy has been used as part of the treatment, and people with a history of salivary gland cancer need to be continually monitored for the possibility of relapse or distant metastasis. Fatigue and other symptoms that are due to treatment can be helped by special rehabilitative efforts. Rehabilitation is a major part of follow-up care after head and neck cancer treatment. People may receive physical therapy and speech therapy to regain skills, such as speech and swallowing. Supportive care to manage symptoms and maintain nutrition during and after treatment may be recommended. Some people may need to learn new ways to eat or to eat foods prepared differently. People may look different, feel tired, and be unable to talk or eat the way they used to. Many people experience depression. The health-care team can help people cope and connect them with support services. Even after being diagnosed with cancer, quitting smoking is still helpful. Continuing to smoke during cancer treatment may decrease the effectiveness of treatment, cause second cancers to develop, and worsen treatment side effects, such as diminished voice control. Even people who have recently quit are more likely to recover better than individuals who continue to smoke.